In Star Wars: The Force Awakens, Luke Skywalker (Mark Hamill) is missing and a new government run by the dark side has taken power. General Leia (Carrie Fisher) sends the rebel pilot Poe Dameron (Oscar Isaac) to retrieve information that could lead to his whereabouts. Elsewhere, a disillusioned storm trooper named Finn (John Boyega) tries to escape from his life and a badass scavenger named Rey (Daisy Ridley) finds a robot that leads to a heap of trouble. When Finn and Rey unite, they meet friends like the aging Han Solo (Harrison Ford) and foes like the mysterious Kylo Ren (Adam Driver). 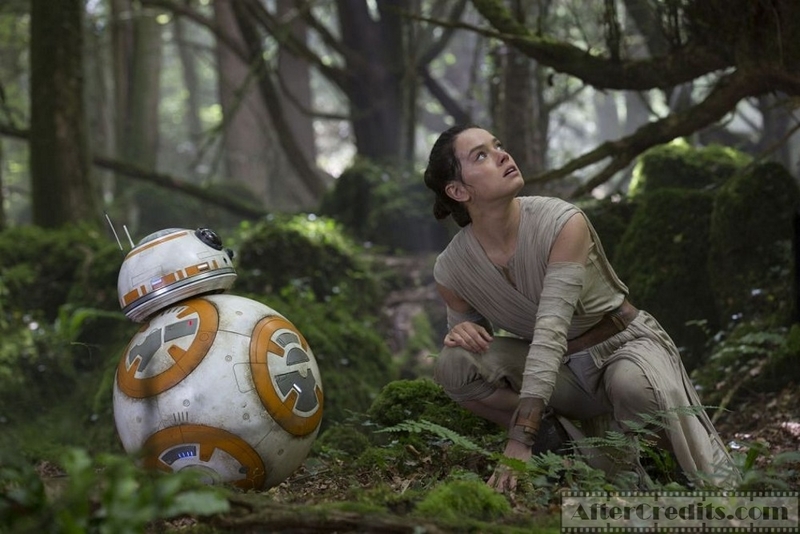 At this point, it feels a bit anticlimactic to be reviewing The Force Awakens. Everyone who’s reading this has probably seen it already and I doubt this review will be influencing anyone from seeing or not seeing this movie. It’s too soon to say whether The Force Awakens will be able to stand the test of time like A New Hope or The Empire Strikes Back but I can definitely say one thing; Star Wars: The Force Awakens is a film made for the fans. However you feel about that statement will probably decide how much you love this movie. Personally, I feel a bit for both sides. This sounds like a mixed reaction but there are a lot of things to admire. For starters, this is a terrific looking movie. I had issues with J.J. Abrams that I’ll get to later but I still think this is his most well directed film to date. Say what you will about the story, this is a movie that feels huge. Abrams understands how important this movie is for many people and he uses the occasion to present the world in a way that feels larger than life. One of the things that people disliked about The Phantom Menace was how lackluster the experience of being in another Star Wars felt. In the Force Awakens, the world is captured through these sweeping, giant shots and possibly the best visuals effects in the franchise to date. Everything about how this movie looks and sounds is top notch. The cinematography is stunning, the production design is marvelous and the costumes and the makeup are perfect. The thing I loved most about The Force Awakens was the time spent just looking at these places that they created. The movie is well paced and it never feels boring or disinteresting. I could go on for hours about the music by John Williams. As much as I love some of his work with Spielberg, it’s refreshing to watch him step away from the more melodramatic, manipulative music he’s done in recent years. The score here is a mix of some of the older, more notable bits of music from Star Wars as well as some new works. It’s exciting and it captures a lot of the magic of the original soundtrack. The technical aspects are the areas where pleasing the fans was beneficial to the final product. Abrams has created a movie that reassures fans that there’s still some magic left in that world they fell in love with while growing up. There’s wonder, there’s life here that Lucas didn’t bring to the prequels. You feel excited and in awe of these planets and creatures in a way that couldn’t me mustered from The Phantom Menace. If the looks and the sounds of the movie are where it excels, the screenplay is where the movie gets dragged down a little bit. It’s not a horrendous screenplay tied to a great filmmaker like Sicario or It Follows but there’s a lot of things about it that feel somewhat repetitive or simplistic. So what did I enjoy about it? Firstly, I liked the way it handled the characters from the previous movies. It was a brilliant move on their part to make the hero from the original movies go missing. The disappearance of Luke Skywalker shows the audience that time has changed and that there are new heroes to find with the old ones like Luke serving as the wise, old trainers reminiscent of Yoda or Obi-Wan Kenobi. The relationship between Han and Leia is also a bittersweet highlight. They haven’t seen each other for several years but they don’t seem angry or upset after meeting again after all this time. They acknowledge that what they once had was lost but they seem to know that deep down, they’re still in love. It’s subtle and sweet in a way that was missing from the similar relationship between Jones and Marion in Kingdom of the Crystal Skull. Han Solo also gets some charming scenes with his friend Chewbacca and Harrison Ford gives one of his more energetic performances in a while. I also enjoyed the villain Kylo Ren because he succeeded in doing in 20 to 30 minutes of screen time what Anakin Skywalker couldn’t do in 3 movies. Both are confused, less prepared young men that begin to move towards the dark side. It works mainly because Adam Driver is a significantly better actor than Hayden Christensen but it also works because the movie manages to make Ren intimidating and weak at the same time whereas Skywalker was just plain whiny and pathetic in the prequels. He’s scared and inexperienced but he ends up making decisions that are legitimately twisted and evil. And while Skywalker’s final transformation came in the form of an overlong fight, Ren’s final choice for the dark sides comes in the form of a shocking, quick scene that will leave a far bigger impact than the entire 5 or 6 hours of Anakin’s character arc. To a lesser extent, I admired the new heroes like Finn and Po. 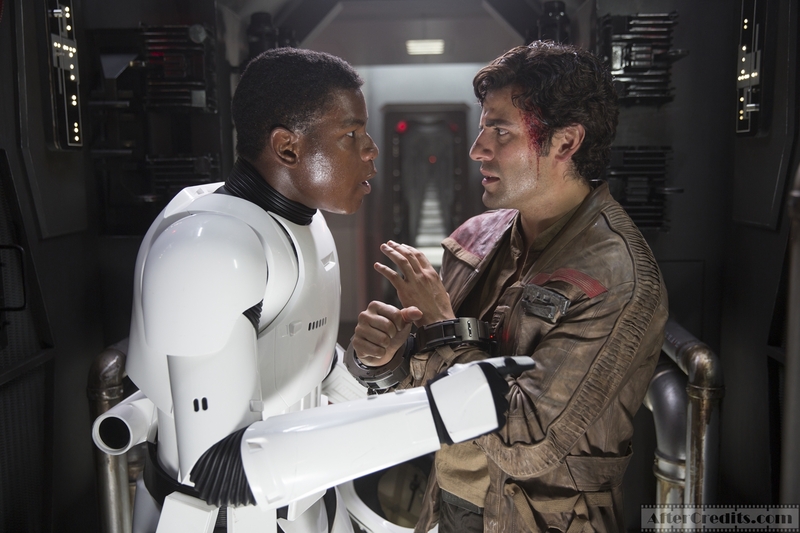 Finn is this emotionally damaged storm trooper who decides to rebel against what everyone else is doing. There are a lot of fascinating places you could take this character and I’m interested to see how he transitions to the real world or if he will try to free the other storm troopers in the later films. As it stands, they don’t really manage to explore many of these things but Boyega’s performance as well as good writing set up what could be potentially the most interesting arc of the three new main characters. Po also starts off strong in the movie due to the acting of Oscar Issac and the friendship he creates with Po is fun to watch. After the first act, he disappears from the movie for longtime and then shows up again near the end. It’s an entertaining character that I assume they’ll do more with in the next movie. The problems I had with this movies script could probably be summarized with the character of Rey. She does cool things and she has some potential, but there are not a lot of things that she’s doing that feel new or memorable. She’s likable and you know she’s important but they write her with such little creativity that you can’t help but feel that she was forgettable. As much as I enjoyed many things about this movie, there’s a lot here that will please the fans but probably won’t please moviegoers who want new or original ideas. Everything that’s great about this movie is either a retread or a follow up of previous movies. The things I liked that did feel new felt pushed aside for something that’s a lot more repetitive and safe. The new evil government feels just like the old one. The big bad creature Ren looks up to is very similar to emperor Palpatine and there big bad plan here is to literally make an even bigger version of the death star, I think you can guess how that works out for them. Besides that, there’s just a lot of beats in this movie that felt added because they had to be there. There has to be a point where the protagonist is reluctant to become the hero even though she hasn’t shown reluctance before said point. There has to be a scene where the old mentor gets killed by the bad guy. 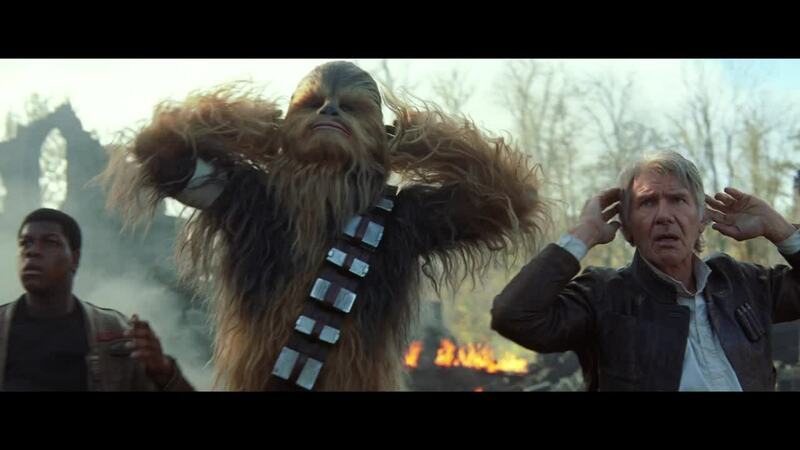 If the direction embraces Star Wars just right, the writing embraces Star Wars a bit too much. The movie goes over a lot of the same territory it has in the past whether you’re talking about the characters or just simple clichés. Creed also had a lot of elements in its story that came from older Rocky films but that movie also had a lot of things in it that were fresh and ambitious. The new things in the new Star Wars are either pushed aside for the old or end up being just blatant copies of the past. This isn’t a complaint that destroys The Force Awakens for me but it is a complaint that covers the entire film. I can only hope that the next movie will expand on the new stuff more and will try to make more of its own thing in the future. So hopefully you know what I now mean when I say that “a film for the fans” is a mixed compliment. J.J. Abrams creates an amazing world that reminds you of everything you loved about Star Wars with stirring music and magical visual effects. But he takes the nostalgia a bit too far and he creates a story that’s extremely reminiscent of previous movies for better or worse. We get a lot of great moments with older characters but we also get a lot of cool, new things that get overshadowed by repackaged storylines. Either way, The Force Awakens is still a fine enough start and it’s fun enough as a big, blockbuster action film to go see this holiday season. The real Star Wars film that I’m looking forward to is the one that’s coming up next that’s directed by Rian Johnson. It seems fitting that they are handing over this franchise to the man who has made arguably the best science fiction movie of the decade so far. 30 years after the defeat of the Galactic Empire, a new threat rises. The First Order attempts to rule the galaxy and only a ragtag group of Heroes can stop them, along with the help of the Resistance. Note: Contrary to earlier rumors, J.J. Abrams recently confirmed at a press conference that there will be no extra scenes shown. 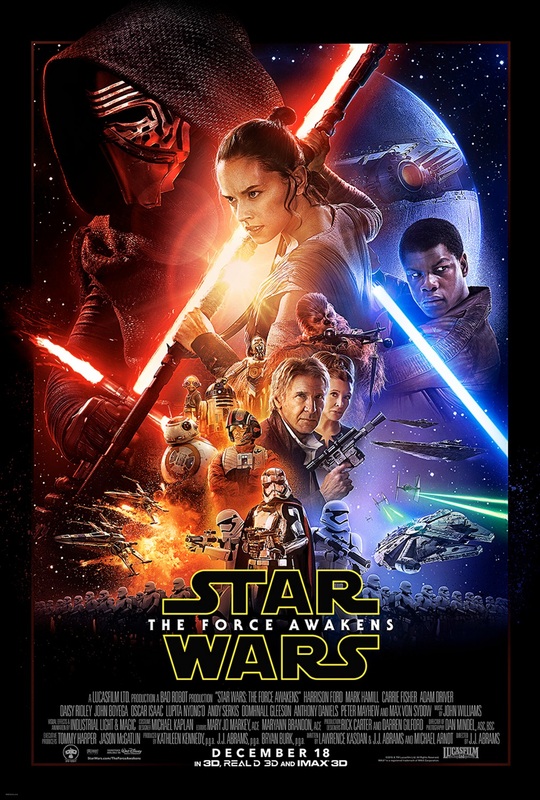 Was seeing Star Wars: The Force Awakens in IMAX 3D or 3D worth the cost?